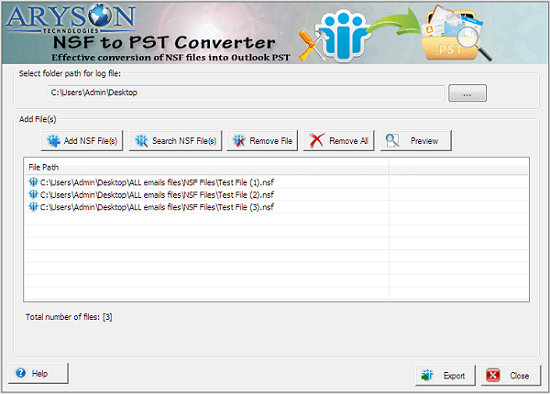 The Lotus Notes NSF Converter is one of the most sought after conversion tool that helps to perform migration from IBM Lotus Notes to MS Outlook. It exports all the mailbox data files from Lotus Notes to Outlook in a safe and convenient way without any loss in data as it keeps a focus on data integrity. It directly imports the files to exchange server of Outlook. Using this NSF Converter from MsOutlookHelp, you can export even encrypted NSF files as it supports files with encryption. You don?t need to remove encryption from the NSF files. Also, it performs batch migration i.e. you can migrate a no. of NSF files at a time. This feature saves a lot of time of users avoiding repetitive task. You can preview all your data files and emails before final saving so that you can make changes if required. Also, it is featured with Date range filter option using which you can select the mail items in a specific date range and avoid unnecessary items. If you are not able to find out a particular file, you can use auto search feature to locate it. This software supports all the versions of Lotus Notes such as 9.0, 8.5, 8.0, 7.0, and 6.5. Also, MS Outlook 97 and above versions are supported by this software tool. User interface is so interactive that even a novice user can use it with ease. Users can download trial version of software for free evaluation and purchase later the full version.